When you’re a high-powered entrepreneurial couple, quality leisure time is priceless. 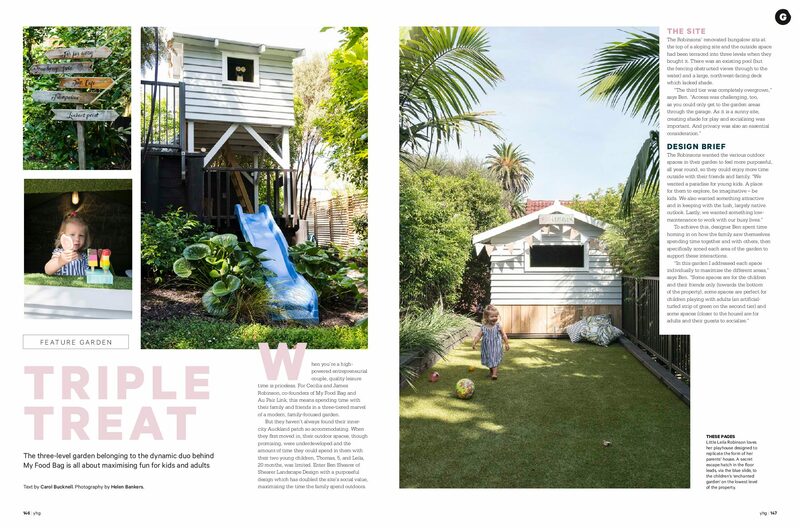 For Cecilia and James Robinson, co-founders of My Food Bag and Au Pair Link, this means spending time with their family and friends in a three-tiered marvel of a modern, family-focused garden. But they haven’t always found their inner-city Auckland patch so accommodating. When they first moved in, their outdoor spaces, though promising, were underdeveloped and the amount of time they could spend in them with their two young children, Thomas (5 and a half), and Leila (20-months), was limited. Enter Ben Shearer of Shearer Landscape Design with a purposeful design that has doubled social value, maximising the time they spend outdoors. The Robinson’s renovated bungalow sits at the top of a sloping site and the outside space had been terraced into three levels when they bought it. There was an existing pool but the fencing obstructed views through to the water, as well as a large north-west-facing deck that lacked shade. To achieve this, Shearer spent time honing in on how the family saw themselves spending time together and with others, then specifically zoned each area of the garden to support these interactions. An area where both adults and children can have fun together, the swimming pool needed to feel more connected to the outdoor living areas. “Replacing the existing fencing with wrap-around glass allowed the spaces to move fluidly into one another without compromising the safety of small children,” says Shearer. Ben’s aim was to ensure the bottom level of the garden, “where children rule the roost”, felt like a real escape. “An enchanted garden fit for fairies,” the designer used moss-like plantings, the delicate flowering groundcover Fuchsia procumbens and lots of child-friendly edibles including strawberries and feijoas. A stepping stone path, slide from the playhouse and a whimsical sign post add to the child-like enchantment of the space.